"Object of attack, to take over strategic centres and assume control of all human authority." Green comes over to the War Machine which allows Ben to escape. He encounters the controlled Polly while leaving and she locks him in and he is seized. He is brought to the War Machine.... The Doctor is wondering what has happened to Ben but Sir Charles is worried about C-Day being delayed. Polly gives Green orders from WOTAN and Ben is spared to be put to work for WOTAN. The workers are being worked into the ground in time for the deadline which Polly informs Ben is tomorrow at noon. Explosives and armaments are being collected at the warehouse. 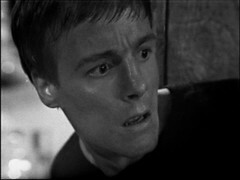 Ben escapes, leaving the weakening Polly behind and seeks out the Doctor, telling him of what he has found. Polly is questioned about her part in Ben's escape and it becomes obvious her conditioning is failing. 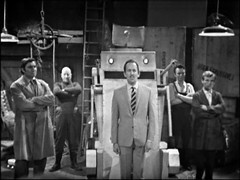 The Doctor deduces that there may be other machines and thinks they should attack WOTAN. 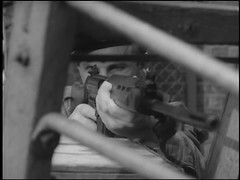 Sir Charles arranges for the army to raid the warehouse in Covent Garden. 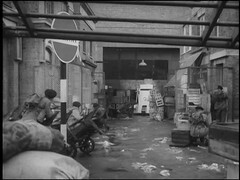 The army sends a patrol to enter the warehouse and they are attacked by the War Machine and some of the workers. Their weapons are jammed by the War Machine. Suffering losses they retreat taking the battle into the street outside and exposing the threat to the onlooking Sir Charles & The Doctor. The War Machine advances down the street and as everyone else flees The Doctor stands still ready to confront the enemy. THAT is a fabulous episode ending. As everyone else flees the Doctor stands his ground in front of his approaching foe and as the closing title music starts we zoom in even closer on the Doctor! Up until then this episode has been a little Hartnell light: he spends the first half sitting around in Sir Charles' house and then doesn't turn up till near the end of the incursion into the warehouse, it's still a cracker with Ben in particular getting a chance to shine opposite the WOTAN controlled Polly. Polly too is good here with the insinuation being that her feelings for Ben have stretched WOTAN's programming of her. GREEN: You tried to warn human authority of our work in this building. You are an enemy of mechanised evolution. Nothing must be allowed to prevent the machines taking over. They are the next stage in the growth of life force of Earth. All obstacles will be swept aside, including you. BEN: Are you all mad?! It'll be your turn next. GREEN: We are needed by WOTAN. WOTAN will decide our fate. BEN: You are mad. All of you. Look, Polly, can't you see what's happened to you? GREEN: What does the girl want? POLLY: I trapped him. I did not let him escape. POLLY: WOTAN requires all the labour we can find. It is too soon to destroy this stranger. Let him work and destroy him later. GREEN: How do you know what WOTAN wants? POLLY: I have just come from Professor Brett. These are his orders and the orders of WOTAN. GREEN: Very well, let him live. He will work for us. We must all work. Go back to your work. BEN: Strewth, that was a close one. Thanks, girl. Well, you really played them along. You even had me fooled. POLLY: You have been spared. Now you must work hard for the success of this great new cause. POLLY: The victory of the War Machines. There's probably some outright lies in there insisting she's just returned from Brett with WOTAN's orders. She then seemingly does nothing to prevent Ben slipping away later, now armed with the knowledge of what WOTAN is planning. 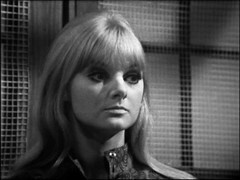 With Episode 2 already in the BBC's hands the search was on for the remaining episodes. In 1984 all four episodes of The War Machines, along with all four episodes of The Time Meddler (one of which was already in the BBC's hands) and all six episodes of The Web Planet (all six of which the BBC had) were found in Nigeria. However there was a delay returning these episodes to the UK because diplomatic relations between the UK & Nigeria were severed following the kidnap of a Nigerian politician on UK soil. The episodes eventually found their way back to the BBC in early 1985. Once returned it was then discovered that the copies of the Time Meddler & War Machines have small sections missing, matching the cuts made by the New Zealand censors. Over the years much of this material has been discovered either in the material cut & retained by the Australian censors or, in one case, in an edition of Blue Peter covering the War Machines. See here, here and here on the now sadly defunct Restoration Team Website for details. There's also a special feature on the Doctor Who: The War Machines DVD called WOTAN Assembly which takes a close look at how this story, and in particular this episode, was pieced back together. In addition a section of film footage from the end of the episode was discovered in private hands and this is of a noticeably better quality than the rest of the episode. The quality really jumps as the War Machine crashes through the door. A good indicator of how much better quality the film insert is is to compare it with a similar shot from the original print: the shots bellow give a night and day difference! Actually that frame marks an important moment: it's the first time I can identify Pat Gorman in Doctor Who! Pat Gorman has been in *EVERYTHING*. 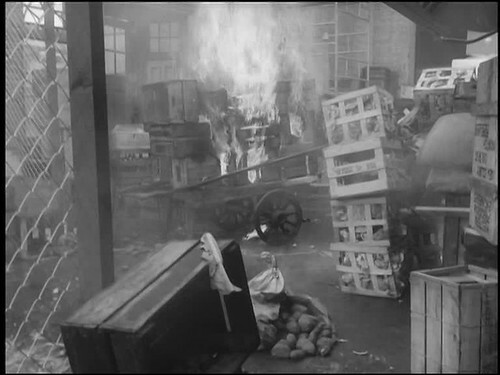 Prior to this he was a Freedom Fighter/Rebel in World's End, The Daleks & Day of Reckoning, the first three episodes of Dalek Invasion Of Earth, but I've never spotted him there. Then he was a Planetarian (Alien Delegate) in Mission to the Unknown, a Greek Soldier in Temple of Secrets, Death of a Spy and Horse of Destruction, the first, third & fourth episodes of the Myth Makers, followed by a Guard in The Massacre 2:The Sea Beggar. IMDB credits him, with being a worker in this episode, not a soldier, and indeed m'learned friends tell me he is a worked in episodes 2 & 3 but I've never spotted him in that role. 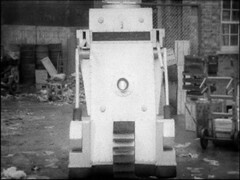 After this story he is (deep breath) a Monk in The Abominable Snowmen, a Guard in The Enemy of the World episode 4, a Cyberman in The Invasion episodes 4 and 6-8 for which he gets his first onscreen credit and a Military Policeman in The War Games episode two, all stories featuring Pattrick Troughton as Doctor Who. During the third Doctor Jon Pertwee's era he is a Silurian in Doctor Who and the Silurians episode 2-4 and the Silurian Scientist episode 5-7 of the same story, a Technician in The Ambassadors of Death episode 1 & 3, a Primord in Inferno episode 5 & 6, the Auton Leader in Terror of the Autons episode three & four, a Primitive and Voice in Colony in Space episode one & two, Long in episode three, a primitive in episodes four and six and a Colonist in episode five followed by a Coven Member in The Dæmons episode four & five, a Guard in Day of the Daleks episode three and a Film Cameraman in episode four, a Sea Devil in The Sea Devils, a UNIT Soldier in The Three Doctors episode on, an Earth Guard in Frontier in Space episode one, a Presidential Guard in episode two and a Sea Devil in Frontier in Space episode six. He's then a Global Chemicals Guard / 'Nuthatch' Resident in The Green Death episode one and a guard in episodes four to six, a UNIT Corporal in Invasion of the Dinosaurs part two, a Guard in The Monster of Peladon parts one, three & six and a Soldier in Planet of the Spiders part two: you can easily spot him there at the start of the chase sequence! For the fourth Doctor Tom Baker he appears as the Gate Guard in Robot part one, a Thal Soldier in Genesis of the Daleks part two, a Cyberman / Dead Crewman in Revenge of the Cybermen part one, a Guard in The Seeds of Doom part three to five, a Soldier in The Masque of Mandragora part one, where Tom Baker spots him and mentions him on the commentary, followed by a Brother in The Masque of Mandragora parts two to four, a Chancellory Guard in The Deadly Assassin parts one and two, a Medic in The Invisible Enemy parts two to four, a Kro in The Ribos Operation parts three & four, a Pilot in The Armageddon Factor parts three, four and six, a Thug in City of Death part one, a Gundan robot in Warriors' Gate parts two & three and a Foster in The Keeper of Traken part one. With the fifth Doctor Peter Davison he's Grogan in Enlightenment parts one & two and a Soldier in The Caves of Androzani part one while his final appearances are in the Sixth Doctor Colin Baker's second story Attack of the Cybermen as a Slave Worker in part one and as a Cyberman in part two. He is one of the most frequent contributors to Doctor Who appearing in over 90 episodes and yet I've never seen him interviewed. 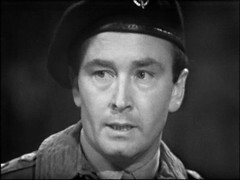 Beyond the Doctor Who he's also appeared in Adam Adamant Lives, The Prisoner, Dad's Army, Doomwatch, I Claudius, Porridge, Grange Hill, Z-Cars, The Sweeney, The Professionals, The Nightmare Man, Day of the Trifids, Blake's 7, The Young Ones, the Camfield production of Beau Geste, Allo Allo, The Bill, Magnum PI & Poirot. See I told you he'd been in everything! 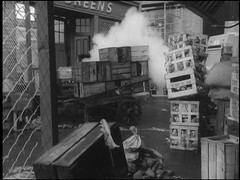 The high quality sequence from the film insert includes most of the exterior filming from the episode which was recorded outside of Ealing Film Studios on 25th May 1966, the day after two days interior filming at the studio for the sequences inside the warehouse. 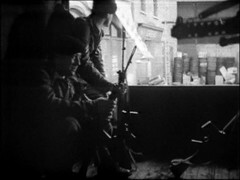 The sequence also spotlights the soldiers in the story. 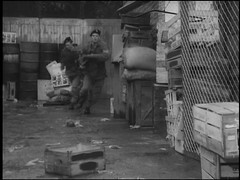 If you hadn't thought you were watching a Jon Pertwee story before now you certainly feel it as the army shows up and soldiers wade into the warehouse. All we need is an "ACTION BY HAVOK" caption and the authentic Pertwee feel would be complete. We'll get used to the sight of the army assisting The Doctor, usually in the form of Brigadier Lethbridge-Stewart and UNIT, but this sis the first time it's happened. 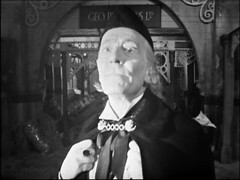 As with the Doctor wandering round London and using the telephone it's another thing that it looks odd to see William Hartnell's Doctor doing. There's a little bit of confusion during the battle as it's not clear what's happening only been clarified in the closing moments that the soldier's weapons have jammed! The army captain is played by John Rolfe. He'll return in The Moonbase as Sam Becket and The Green Death: Episode Two & Three as Fell. He's got a Out of the Unknown to his name as Rawlinson in This Body Is Mine, Survivors as Summers in Manhunt, Rentaghost as Mr. Green in the first episode of the second series and Blake's 7 as Terloc in Project Avalon. 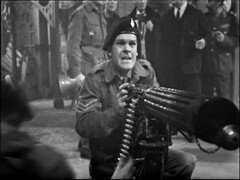 The soldier who leads the assault on the warehouse and is later seen trying to operate the machine gun is Frank Jarvis. He'll play Ankh in The Underworld 3 & 4 and Skart in The Power of Kroll. He's got episodes of The Sweeney and The Professionals on his CV but you'll probably know him best as Roger in The Italian Job. Two of the soldiers have credits earlier this season to their name: Donald Symons was a Trojan Soldier in The Myth Makers 3: Death of a Spy while Robert Pearson was in The Massacre 3: Priest of Death as Council Member. 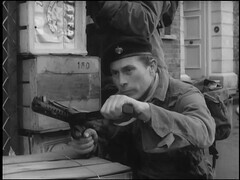 One of the other soldiers, Terry Wallis will return next year in The Moonbase: Episodes 3 & 4 as a Cyberman. And finally, amongst the soldiers, I'm pretty sure that's Mike Reid sitting in the back of the truck as the soldiers arrive. We'll get a much better look at his boat race next episode. 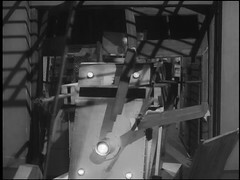 In amongst the workers in the Warehouse, but instantly recognisable due to his bald head, is Hugh Cecil who was a Technix in Dalek Masterplan 1: The Nightmare Begins and a Priest in The Massacre episode 2: The Sea Beggar. He'll be back as an extra in Doctor Who and the Silurians episode 6. He's got a Blakes 7 too as a Menial in Ultraworld but is probably most famous for his appearance in The Rocky Horror Picture Show as a Transylvanian. You can get a decent look at him earlier in the episode as he helps unload some equipment in the warehouse. 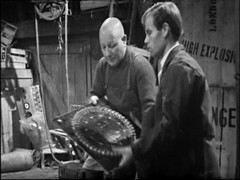 We've seen the item he's passing before as well: it's the Dalek's Rel counter from the very first Dalek story! One of the workers, Peter Day, has had an interesting Doctor Who career on both sides of the camera. He started out in (yup, you've guessed it) The Massacre 1: War of God as a Tavern Customer before appearing in (yup, you've got it again) Myth Makers 3: Death of a Spy as a Trojan Soldier. This is his last on screen appearance as he now moves into Visual Effects working on The Evil of the Daleks, The Tomb of the Cybermen, Fury from the Deep, The Ambassadors of Death, The Dæmons, The Sea Devils, The Monster of Peladon, Genesis of the Daleks, The Deadly Assassin & The Sun Makers part. 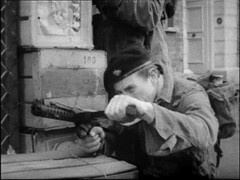 Among the rest of the workers Alan Wakeling and Eddie Davis were both in The Massacre 3: Priest of Death as a Parisian Man and a Parisian in Rue des Fosses St. Germain respectively. 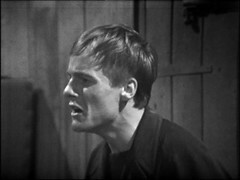 It's a first Doctor Who appearance for Jay McGrath who's back for Doctor Who and the Silurians: Episode 3 as a UNIT Soldier Image of the Fendahl Parts Three & Four as a Coven Member (uncredited) and The Two Doctors: Part One as a Dead Androgum.